You can continue zooming in like this until you get down to the hour scale, at which point you won't be able to zoom in any further. Preceden won't necessarily use the exact dates you selected with either method. It will automatically add some padding to the content and try to avoid cutting off event names that would otherwise appear half on/half off your timeline. 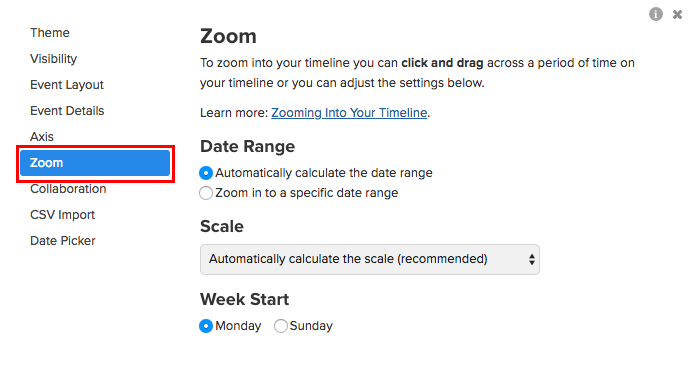 If you are zoomed in to a portion of your timeline and then add an event that isn't visible on that portion of your timeline, Preceden will automatically zoom out so that the newly-added event is visible. If you encounter any strange issues with zooming please don't hesitate to reach out at help@preceden.com.